Dr. Lohi has released the following Report to the Canine Health Foundation on the current progress of our research project. “In the Alaskan Malamute chondrodysplasia study, we have been using two complementary research methods to discover the causative mutation: exome sequencing and DNA-marker based genome-wide association mapping. Thus far we have analysed genome-wide data from ten affected dogs and up to 87 healthy control dogs. Part of the control cohort was obtained from a previous cataract study. The Alaskan Malamute chondrodysplasia is thought to have an autosomal recessive mode of inheritance and we have performed our data analyses under this model. We have now identified a chromosomal region that shows association to the disease. This region was identified by using several different genome-wide analysis approaches, which included both basic case-control association and family-based methods. The finding is still tentative because our sample cohort has some issues concerning unwanted population structure. The affected dogs form a separate cluster from the control samples, which means that they come from a separate line of dogs than the control dogs. This population structure can have an effect to the results by introducing false positive findings that are caused by the population difference and not by the difference in affection status. To correct this problem, we have recently genotyped a new sample set of seven affected and seven control dogs but unfortunately half of these sample failed because of their poor quality. We have previously performed exome sequencing to one carrier dog and two affected dogs, and now we are in theprocess of sequencing four additional affected and two additional carrier dogs by using an updated exome sequencing platform. The main obstacle in this study has been the availability and quality of samples. Many samples of affected dogs have been received as old DNA samples that have had both low DNA-quality and quantity. Furthermore, control dogs that are closely related to the affected dogs have been difficult to obtain, and this has caused the problems in population structure. Dr. Lohi’s research group has just received a set of samples from Dr. Venta’s original research project. This represents a number of additional affected and carrier dogs and should greatly facilitate the research project and progress. Dr. Lohi has applied for and received an Acorn Grant through the American Kennel Club’s Canine Health Foundation to help facilitate the research project. 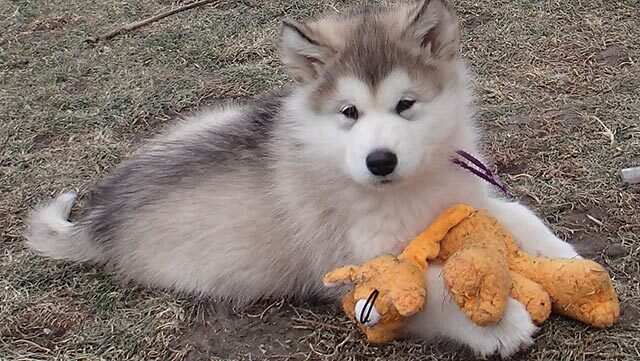 This grant has been fully funded by the Alaskan Malamute Research Foundation. The researchers have checked 28 variants from the exome-data in a bigger sample cohort but unfortunately none of these variants showed perfect segregation with the disease. They are currently performing the lab work to check another set of 27 variants (ioinformatician re-analyzed the exome-data with another program and with some new interesting variants that they are looking through). The researchers have identified approximately 30 variants of interest in our samples, and are running these through further analysis. Additionally, they will be doing a SNP-chip genotyping study which will hopefully increase our chances to find the causative mutation. Additional new samples from carriers and an affected dog are being sent to the lab, which will help Dr. Lohi’s group confirm any findings they may uncover. We should know more in the coming few months. We have informed them that if any funds are needed to accelerate the research, we will do what is needed to provide these through the Canine Health Foundation grant process using our Donor Advised Fund. At the beginning of 2011, we were told that the researcher at MSU who has been working on this project for years, Dr. Pat Venta, was willing to collaborate with another researcher who had more advanced technology in an effort to find this gene. Unfortunately, several months later we were informed that he had decided against this collaboration and wanted to pursue a grant on his own to do the research. At this time no grant has been pursued. Because finding the gene for dwarfism is a priority, we are exploring all other options for this research. Dr. Hannes Lohi at the University of Helsinki discovered the gene for dwarfism in Norwegian Elkhounds, but samples from our dwarfs have found that this is not the same gene. However, his research team has taken on finding this gene in our breed–at no cost.We have gathered samples from all currently living dwarfs and dwarf carriers and have shipped the majority of these to their facility in Helsinki. These samples have been run through a whole exome scan platform, which is the most advanced genetic analysis available. They hope to have the results from this in a few months, at which time they will look for abnormalities which may represent the gene for the disease. How long this will take depends completely upon what the genetic results look like, but we feel confident that this team is doing everything that can be done on this project as quickly as is possible. They have been extremely responsive to any questions we have, and have been very proactive in asking us questions as well as getting any samples into their lab.